Eileen Tumulty is the only child of alcoholic Irish parents, growing up in New York in the 50s and 60s. She dreams of reaching an upper-middle class respectability, having a comfortable suburban life. Eileen feels that her key to that life is to marry the right man. But she falls in love with Ed Leary. It doesn’t take too many years before she realizes his dream for the future is different than hers. In time, Eileen and Ed manage to have a son, Connell. Eileen transfers many of her hopes for the future onto her son. But while she hunts for houses in respectable suburbs, her huband grows more and more resistant and withdrawn. Eileen has to face the fact that life- and her choices- have led her to a very different place than the future she dreamed of as a young girl. The story of We Are Not Ourselves is nothing new, but the characters are drawn with an incredible insight thst makes the book irresistible. This is a book that you stay up late to read, and wake up early to read- but every so often, you have to pause, and just let the words sink in. This is a book that spans generations and lifetimes, but no words are wasted. Every song, every literary reference, every house has been crafted by the author as part of the story. We Are Not Ourselves is a story of family, of dreams, and of love- in all its many forms. It easily leapt onto my Top 10 list for this year. 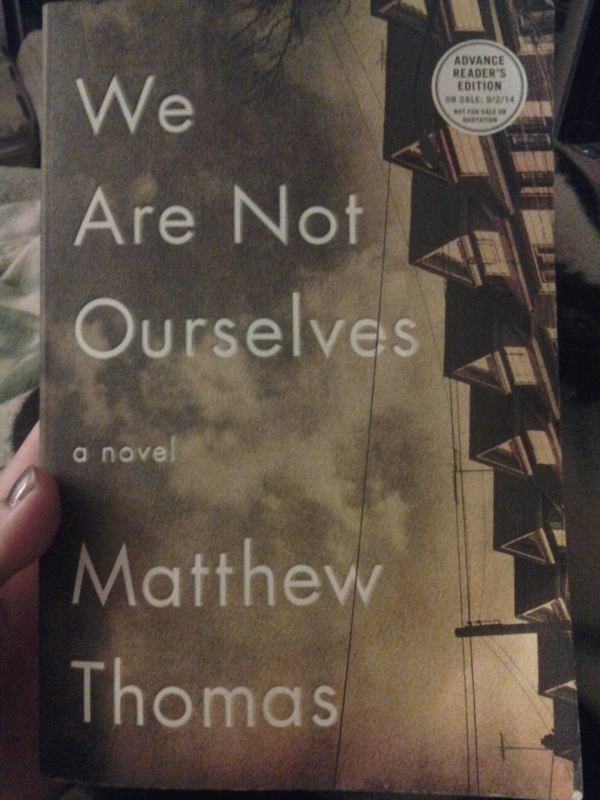 I believe we will be talking about Matthew Thomas and his brilliant writing for years to come. I don’t usually do much of a personal reflection but this excellent novel has given me a surplus of thoughts. I’m talking about some later plot points tho so spoiler warning. Eileen fixates on owning a house as a symbol of success for her family. First she buys the multi-family house where they live, and moves into the best apartment. Not content with that, she starts touring homes in upscale neighborhoods, but she has delusions of grandeur. When she is finally honesy about what she can afford, the perfectly respectable houses seem shabby by comparison. Eventually she buys a house at the very top of her price range that she can only afford because of extensive water damage. When she moves in, tho, she doesn’t start to repair the roof or the foundation- she focuses on the dining room and kitchen so she can throw dinner parties. Thomas sums it up: “The base of the house might be rotting, but the visible portion was commanding enough…” He writes about a house, but he’s also giving insight into Eileen. It’s very well done. Also. After several years of erratic behaviour, Eileen’s husband Ed is diagnosed with early onset Alzheimer’s. It made me think of my grandfather, who also has Alzheimer’s (although he is 90.) Some of Ed’s behaviors seem familiar. I’m starting to consider that maybe some of the things we kids thought were just Grandpop being Grandpop were, in fact, the coping mechanisms of a smart man realizing that things in his brain weren’t quite as fixed as they used to be. For example, writing in block letters instead of cursive, or making obsessive lists. But the line that hit home, written from Connell’s perspective, was: “…during the period when he’d gone around labeling everything.” I’m pretty sure every one in my extended family has inherited something labeled in my Grandpop’s big block letters.